Did the 4-1 scoreline flatter England? Where now for Shikhar Dhawan? With an average of 25.80 from 15 Tests in SA, England, NZ and Australia, should he continue being one of India's first-choice openers? How many times could you binge-watch GoT while Cook was batting? #PoliteEnquiries: Were India or Pakistan the better touring side? Without Kohli, can India avoid Black Tuesday? #PoliteEnquiries: Who is the better captain - Root or Kohli? #PoliteEnquiries: Will Cook bowl before Rashid? "I can hit a golf ball a long way but struggle with the cricket ball"
How do you replace 12,000 Test runs? Vihari for Pandya, Jadeja for Ashwin? Is this Indian side really ready to scrap? Cooky's monster and others: How well do you know your Test streaks? #Polite Enquiries: Did England deserve the series win? The England captain has batted at No. 3 throughout the summer but says he made a "spur of the moment decision"
#PoliteEnquiries: Was Bairstow's duck a protest at losing the gloves? #PoliteEnquiries: Did Pujara show enough intent to keep his place? #PoliteEnquiries: Time to drop Curran again? Dobell: Are England an accident waiting to happen or a grand design? Kohli or Root - who has top-scored more often in Tests? Will Virat Kohli name an unchanged India XI? Could Bairstow retain wicketkeeper role? Gloves Off: Has Kohli won the battle against Anderson? Will Moeen Ali earn a recall at the Ageas Bowl and can Sam Curran find a place in the XI? Switch Hit: Is England's top order Cooked? What does Vijay's exclusion from the India squad for the final two Tests against England mean, and is Jadeja back to being India's No. 2 Test spinner? 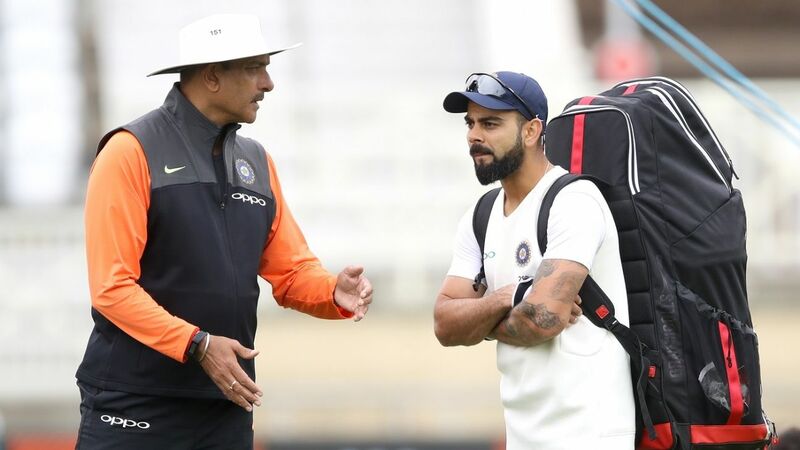 Head coach says in all his time in the job, this was the best performance from India "as a batting unit, as a catching unit and as a bowling unit"
#PoliteEnquiries: Who's the next batsman in England's revolving door? #PoliteEnquiries: Why are England either comfortable or catastrophic? #PoliteEnquiries: Why can't England convert 10s into 20s? England's top-scorer insisted the players will "dust themselves down" after a "very poor day"
#PoliteEnquiries: How long before Kohli is Rashid's bunny? Monga: India refuse to take a backward step, but is it prudent? Rishabh Pant in line for debut at Trent Bridge?